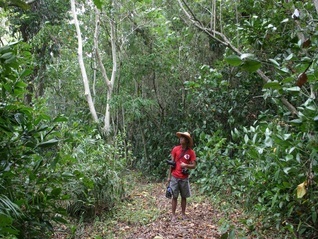 Ecotourism refers to a form of sustainable tourism within a natural and cultural heritage area where community participation, protection and management of natural resources, culture and indigenous knowledge and practices, environmental education and ethics as well as economic benefits are fostered and pursued for the enrichment of host communities and satisfaction of visitors. Ecotourism is a concept that provides a “win-win” situation especially in protected areas and natural destinations that may be sensitive to human impacts. Over the years there has been much confusion over the concept that several places are being promoted for ecotourism despite that fact that they are not practicing or demonstrating sustainable principles. Understanding these principles is part of the responsibility of proponents who wish to engage in ecotourism related projects. 5. Balanced development by taking into consideration economic, environmental and social goals. What is an ecotourism product? An ecotourism product is an experience intentionally put together for the satisfaction and enjoyment of visitors. It is composed of both tangible and intangible elements found on site which collectively contribute to the quality and value of the experience. An attraction alone is not a tourism product that can already be sold. It is a base product which needs other elements in order for it to be marketable to a specific market segment. Marketing a base product will most likely lead to destruction, and consequently to a reduction in its value. Being an experience the tourism product is perceived by the five senses - sight, feeling, taste, hearing and smell. In addition, the experience is also processed and remembered by the brain, retained, appreciated and felt by the heart. What is ecotourism enterprise development? An important component in any ecotourism project is the development of micro enterprises that supports the local tourism industry. In order for communities to have an active role in ecoturism, they should have the capacity to provide various services to visitors. They can be trained as guides, caterers, producers of souvenirs or camp mangers. Training/capacity building and the implementation and core standards are important in order to ensure that products are viable and marketable. Exploring income streams for communities is one of the key towards increased economic benefit and the inclusion of several members including women, out of school youth, fisher folks, farmers and local craftsmen. Three major enterprises provide economic incentive for communities to be actively involved in the management of coral reefs, forest and river with mangroves. Forest Adventure provides trekking and hiking experiences with interpretations to visitors. Reef Discovery is designed to introduce people to the marine environment through snorkeling. 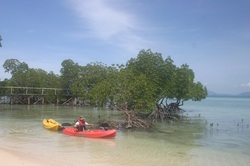 River expedition is a riverine paddling experience within mangrove areas. Even local healing practices can be an excellent base product of the Island Spa concept that highlights "hilot" and healing massages and use of local herbs for special tea preparations. Nature Village is a campsite development concept designed to encourage visitors to stay longer with the community by camping in designated camp sites. Culinary is a catering enterprise that promotes sustainable practices in meal preparation and kitchen management. Arts and Craft is a sustainable souvenir development program that capitalises on abundant indigenous materials. 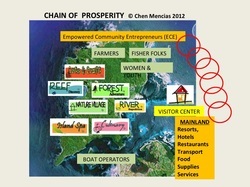 A tourism concept that aims to achieve economic goals while promoting community development. It provides opportunities for visitors to participate in community activities such as repairing houses, transplanting mangroves, rehabilitating a forest, constructing a school house, building a visitor information center or simply teaching people skills. While volunteerism is not your usual holiday it provides an individual a chance to “feel good” by extending himself/herself for the benefit of the environment and the community. It is travel with a “bayanihan” spirit. Ecotourism Philippines Spirit of Batanes is an example of a product that integrates volunteerism.